Some say ‘superwoman’ quite earnestly, others jokingly, but it has the same effect on me. A mix of inner frustration, angst, ambivalence, at times even shame. Underneath it all, the feeling of it being such a ‘sham’ – this superwoman thing. I used to protest, ‘No, no, I am not at all because x, y, z etc.” but that just came across as a humble brag and resulted in eager reassurance. At times it got awkward. Nowadays, I don’t say much in response. But truth be told, I feel less ‘super’ now than at any other point in my life. I just turned 40. I’m meant to be getting to the point of having things pretty tight and together right? The reality is more fragmented and flustered. Don’t get me wrong, I love my life. I love being a psych, I worked incredibly hard to be one all those years ago, I love my work with culture and with people, and the impact I can make. I love being creative and I love watercolour painting. I love my friends, family and my kids, my god, my kids (!). More than ‘all of the above’. But I am so far from anything like superwoman. In striving to have all of these things, in loving and investing in all of them, none of them ever gets ‘me’ – as in, the best version of me. They certainly aren’t getting the ‘super’ version …if there was one. And I don’t get all of ‘my loved things’ – all of the time. It’s the law of diminishing returns but applied to relationships and life. The more I give to a greater number of pursuits, the less each one receives. But they are all a core part of me. This picture came home from kinder today. 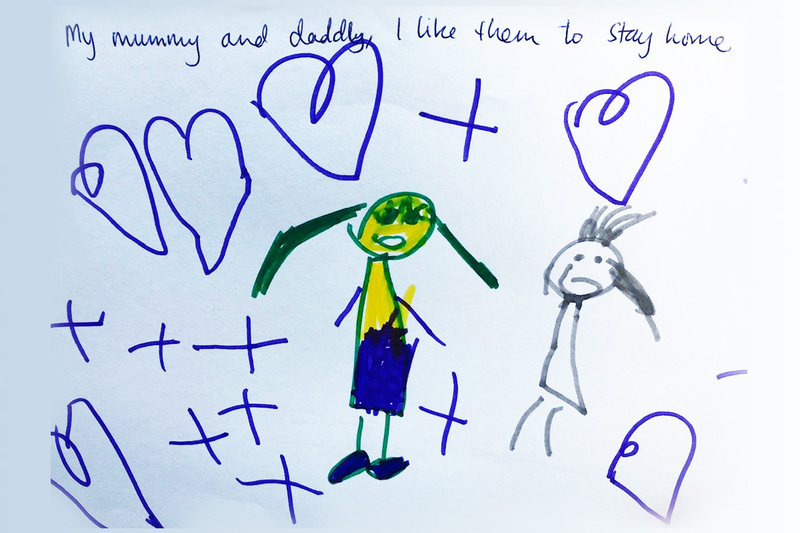 My daughter told her teacher it was a picture of ‘My Mummy and Daddy, I like them to Stay Home’ and so that was now the title of the artwork. It depicts some pretty clear emotions for a 3 year old. And I think you’ll agree. It doesn’t scream of superhero parenting. It’s confronting and you know what, it hurts. The same way it cuts when my eldest daughter texts ‘too late now’ when she reaches out but it takes me a hours to respond after a day of B2B meetings. But this is the the reality some days. So I am sharing it. Because I don’t think I am the only one that wants to debunk this deceptive superwoman thing. Sharing this little painting is one way I can show how I struggle with the title superwoman and super-mum. And while we are on the topic and reflecting on the subjects in the painting, my husband isn’t superman – thou interestingly he doesn’t get afforded that title despite us juggling the same number of balls, or I should say eggs. That’s another discussion. Written by Fiona McUtchen, Group Manager Learning and Organisational Development Epworth Healthcare.